Gabrielle makes a rare mounted appearance in SACRIFICE II. In the age of myths, gods, and warriors, it is unusual for a sidekick not to follow in the footsteps, or more appropriately the hoof prints, of her mentor. Gabrielle, the spunky, vivacious sidekick, and friend of Xena, prefers to use her two feet, aided by her Amazon staff. Does she have a phobia regarding horses? Let us look into the underlying reasons behind Gabrielle's horseless state. His name was Tympani. I only tried to ride him once. It didn't work out, for either of us. Still, he used to follow me around everywhere. I even let him sleep in my room a couple of times. So although Gabrielle never resumed riding, she developed a bond with her little pony. This natural affinity carried over to Tobias, the donkey, in A SOLSTICE CAROL (33/209). Though she was not seeking a mount, Gabrielle could not stand by and watch a fellow creature, human or otherwise, be abused. Thus, she bought the donkey from his cruel master. At the end of the episode, she gave Tobias to a traveling couple she and Xena encounter on the road, in order that the woman and her newborn could have a comfortable journey. Gabrielle's reluctance to ride seems due to the imposing size and movements of horses. 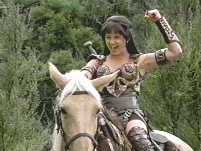 In DREAMWORKER (03/103), Xena suggests that Gabrielle ride with her on Argo. Gabrielle quips back, "[not] until they make those things closer to the ground". Gabrielle thus expresses the fear of heights which has also been explored in SINS OF THE PAST (01/101) and CALLISTO (22/122). Also, Gabrielle feels she can not control the movements of horses, who not only are powerful and fast, but definitely have minds of their own. And Argo seems especially skeptical about Gabrielle when the bard first tries to ride her in THE GREATER GOOD (21/121). Later, in the episode, Argo bolts, with Gabrielle astride, after mistaking a bird's whistle for Xena's. Whenever Gabrielle has been on a ship, such as in ULYSSES (43/219) and THE LOST MARINER (45/221), she became seasick. This suggests the possibility that the rocking motion of ships on water and the rolling gait of horses have similar characteristics. Gabrielle impersonates Xena in THE GREATER GOOD. There have been instances where the necessity for speed required Gabrielle to ride. For example, in THE EXECUTION (41/217), Gabrielle rode behind Xena when they were chasing Meleager. In FOR HIM THE BELL TOLLS (40/216), Xena and Gabrielle rode together in their hurry to reach King Lias' kingdom. They have also been known to ride together when trying to get away from dangerous situations, as in THE RECKONING (06/106) and THE GIANT KILLER (27/203). Also, when Gabrielle recently suffered sprains in the third season ( ONE AGAINST AN ARMY [59/313] and KING CON [61/315]) she had little choice but to ride Argo. Therefore, Gabrielle will swallow her phobia when absolutely necessary. The Xenastaff members have practical explanations for why Gabrielle does not have her own horse. At the 1997 Burbank Con, Liz Friedman, Executive Producer, mentioned that it would be too costly to maintain a horse for Gabrielle. Currently, there are three horses that play Argo. On the character-lever, we wanted to avoid the Sancho Panza look. Gabrielle is a full-fledged character. She is not just a sidekick. It gave us an opportunity to explore other aspects of Gabrielle. Thus we have the various causes of Gabrielle's horseless state. Though not afraid of the horse, she is merely hesitant due to its size and her inability to control its movements. The production viewpoint is one of financial practicality. From a creative stance, Gabrielle is a partner of Xena with her own individuality and style. Who knows? We have some seasons to go, and one day Gabrielle may surprise us with her own mount and ride past Xena. Silver, Diane, "The Steven Sears and Liz Friedman Show or Why Gabrielle Does Not Ride a Horse", Whoosh! , issue 5 (February 1997). Taborn, Kym, editor, "Dreamworker", Whoosh! Episode Guide. Taborn, Kym, editor, "The Greater Good", Whoosh! Episode Guide. I have a B.S. Management from Virginia Tech. My hobbies are reading and Internet surfing. I'm still on the journey, "what will I be when I grow up". My favorite television shows are Xena , Millennium , X-Files , Profiler , Buffy , Silk Stalkings , and HTLJ .